A research team from the University of Kufa reaches to a safe and effective treatment for treating the facial Bloody birthmark by using a neodymium laser. The Department of Pathology at Kufa Medical School nested in the main Kufa University campus. It is a founding department of the School of Medicine and one of the leading departments in the University of Kufa since its establishment. Our preeminent faculty spans from emerging leaders to highly accomplished scientists. The Department is involved in the teaching and training of both undergraduate and postgraduate students. Members of the department have a crucial role in the undergraduate education, by participating in the modules (phase I) and (phase II). Postgraduate studies are available in form of master and PhD in histopathology, haematology, cytology, medical genetic, and molecular pathology. 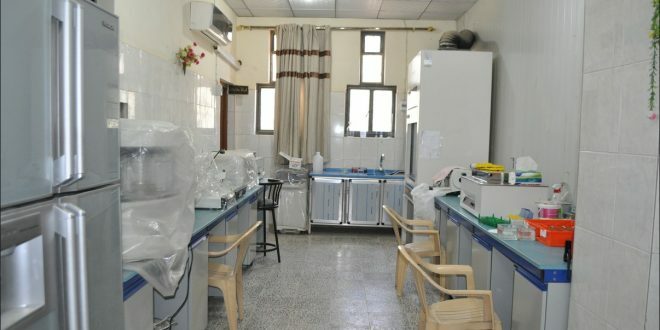 The Department is also a well-recognized training center for Iraqi Board and Arab Board of Health Specialties in pathology. Our vision is the pathology for precision health. Qualifying medical students in pathology is quite important for a high-quality patient care that enhances patient outcomes. •Provide medical students with the highest quality of professionalism in pathology and enable them to understand the basic and essential education in pathology. •Qualify our teaching staff by engaging them in different national and international activities. • Provides preeminent patient care, and research. Focusing on improving the skills of postgraduate students and empower them with the fundamentals for a powerful pathology approach and to be skillful in different pathology techniques. •To enrich and support the medical college with different departments to successfully apply the current outcome-based curriculum. •To improve our teaching and research staff. •To promote the development of research programs in our department especially in genetic and molecular pathology. Our outstanding pathologists are well-trained pathologists drawn from leading institutions in Iraq and from the United Kingdom as well, and immeasurably enhance the vitality of our department, while our excellent staffs are essential contributors to our health care, research, and teaching missions. Together, we work in to provide the best care for our patients, students, advance discovery, fuel innovation, and develop the next generation of biomedical revolutionaries. Thank you for visiting our website and for your interest in our department. We hope you will enjoy learning more about us from the information on our site. We have a training institution aims to rehabilitate students of the Faculty of Medicine in addition to the service society institutions through the establishment of courses and positive interaction in the transfer of expertise and communication with international standards in terms of education and the ability to apply knowledge and scientific research.